Season 5 of Gogglebox Australia begins in mid-February, just in time for the cast to take aim at a bunch of new shows (good luck with that wig, Josh Lawson!). All of the cast is returning. 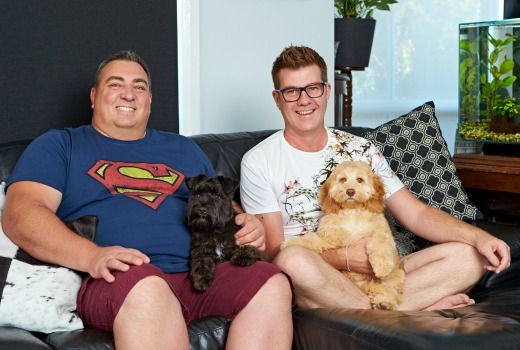 All of the much-loved Gogglebox Australia households from Season 4 are returning for Season 5: best mates and larrikins with a thirst for life Adam and Symon; bubbly Greek best friends Anastasia and Faye; cocktail-loving Wayne and Tom; the sports-crazy Jackson family; the fun-loving and cricket-mad Delpechitra family; vivacious friends and housemates Angie and Yvie; the Indigenous art dealers Mick and Di; the close knit Dalton family; the happily married couple Lee and Keith; the three generations of women in the Silbery family; and old high school acquaintances and housemates Zina and Vivian. 9.00pm Thursday, 16 February on TEN. I watch this, and I wonder why none of the families own a cat. Cats are great for watching TV with! I was dubious about this show at the start but its pretty funny. Its just the dumb stuff we all say when watching shows with friends and family but edited well. I do hope however that these people are getting paid well as this must be the cheapest TV show ever to be made. No sets, fixed cameras, no wardrobe plus the whole show is an advertisement. pretty sure they don’t get paid a cent, just get food and drink provided whilst the crew are at the house. I think the ratings justify it’s existence. Record numbers really highlights its popularity.